One of my favourite Bob Dylan songs. 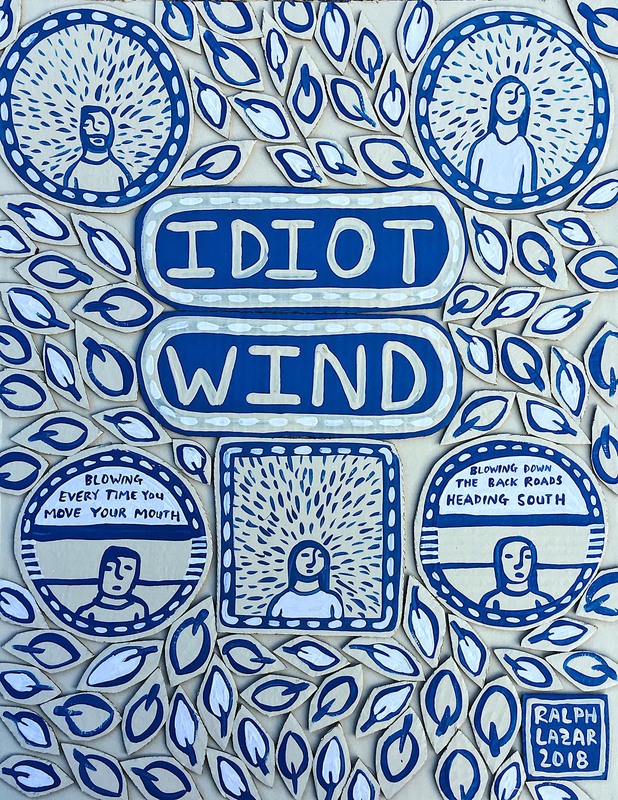 Dylan: “Idiot Wind.” Yeah, you know, obviously, if you’ve heard both versions you realize, of course, that there could be a myriad of verses for the thing. It doesn’t stop . It wouldn’t stop. Where do you end? You could still be writing it, really. It’s something that could be a work continually in progress. Although, on saying that, let me say that my lyrics, to my way of thinking, are better for my songs than anybody else’s. People have felt about my songs sometimes the same way as me. And they say to me, your songs are so opaque that, people tell me, they have feelings they’d like to express within the same framework. My response, always, is go ahead, do it, if you feel like it. But it never comes off. They’re not as good as my lyrics. There’s just something about my lyrics that just have a gallantry to them. And that might be all they have going for them. [Laughs] However, it’s no small thing.